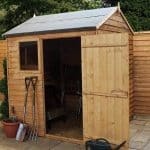 Sheds are very useful for garden storage, as well as providing security for tools and equipment, but they can be so much more than that as well. We love the look of this overlap cladding pent shed, and it will grace any garden for a price that’s hard to beat. The quality is evident from the floor to the roof, so once installed it can quickly become a place where you’ll be happy to spend your leisure time. The slope of the pent roof is a perfect complement to the overlap cladding of the walls, as they both cause water to bounce off them and away to safety. That means that you won’t have to worry about keeping the shed contents dry. Other worries can be allayed too, thanks to the 10 year anti-rot guarantee provided by Shed-Plus, although this is dependent upon regular retreatment by the shed owner. With two front facing windows, you’ll have more than enough natural light in the shed, and because the glazing is made of styrene you won’t have to worry about it shattering or being broken into. The addition of a padlock, available as an inexpensive optional extra, can make this a very secure shed indeed. This pent roof shed with a wide front offers excellent storage facilities, yet it can also be an attractive feature for the garden. 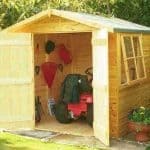 When we review pent roof sheds, we like to make sure that the interior is still roomy enough to walk around in freely and to manoeuvre garden equipment, such as lawn mowers, in and out of. Thanks to the shallow slope, this shed offered no difficulties with either of these scenarios. The roof itself is constructed of solid sheet material, and covered by a durable roofing felt. At its highest point the roof is 2.07m, and the height of the eaves is 1.66m. The height of the door is 1.63m, which is quite reasonable for a pent shed, with a width of 0.66m. The width of the shed itself is 2.0m, with a depth of 1.54m. Overlap cladding is excellent at forcing rainwater to flow safely away from the shed itself, but it is also inexpensive to produce. 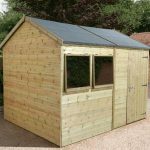 We take careful note of the thickness of cladding offered, and were pleased to see that this shed boasts 8mm cladding making it suitable for everyday use over an extended period of time. The standard frame has a thickness of 28 x 28mm, which provides solidity to the structure as a whole. The flooring is 10mm thick and made of single sheet material. Once again, this provides strength whilst keeping costs down. The integral floor joists have been pressure treated, a process which gives them excellent and long lasting protection against rot, but even so a shed base kit is a smart addition. 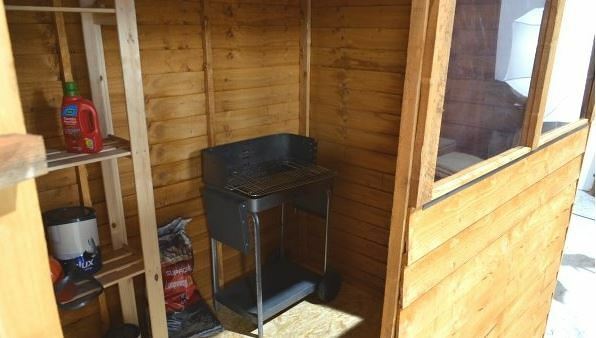 When reviewing this shed we noticed instantly that its timber was darker than could be expected for a European softwood, and that it had a very faint spirit smell. These were welcome signs that the timbers had been thoroughly dip treated, and this is why the manufacturer’s feel confident in providing a 10 year guarantee with this shed. The guarantee is dependent upon re-treatment at least every other year, although we would recommend the annual application of a water or spirit based wood preserver. The door is offset to the left of the shed’s front panel, and is adjacent to the double windows. The door’s hasp and staple locking system felt strong and well secured, and would make a suitable housing for a padlock. The windows themselves are rectangular and held in a fixed position towards the top of the shed’s front face. We found this allowed a good amount of light into the upper portion of the shed’s interior, whereas the lower half was noticeably darker. Nevertheless, the natural light should be enough to make depositing and retrieving items easy. 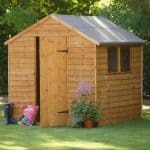 With a shed as attractive as this one, security is an essential consideration. That’s why the addition of a padlock and alarm system should be undertaken. The Yale security kit, available as an optional extra with this shed, performs both of these functions. When we saw the dual window design we were concerned about how secure they would be against an attempted break in, but the toughened glazing is enough to deter opportune thieves. Rather than glass, Shed-Plus have opted for 1.5mm thick safety styrene; it looks and acts like glass, but is much more shatter resistant, making the shed as a whole more secure. As well as the padlock and security alarm kit mentioned above, we would also recommend the purchase of a 6’ X 4’ shed base kit. The base is easy to construct, and once in place it increases the amount of space between the bottom of the shed and the ground. 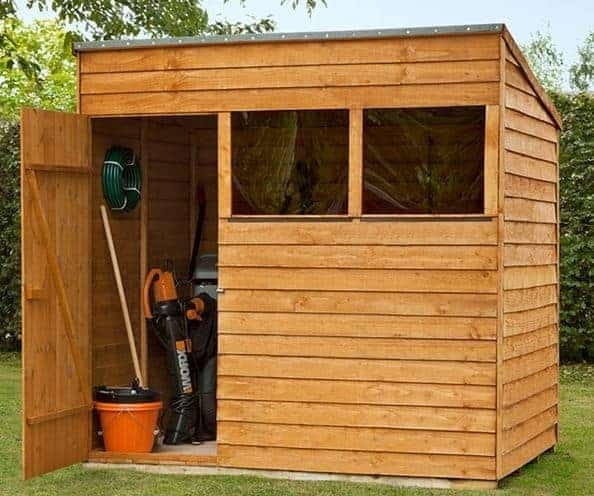 This not only makes the shed feel warmer, and less damp, during cold weather, it can prevent moisture from getting into the shed’s base and working upwards. Another optional extra is a set of four shed hooks. These stylish looking hooks allow you to hang spades, trowels and other equipment outside of the shed while you carry out your gardening. They can even be used to hold hanging baskets to give a floral look to the shed. One further, and very useful, optional extra is shed stain available in shades of either harvest gold or dark brown. 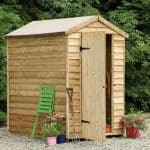 These stains ensure that the shed keeps a uniformly attractive look, even in areas that are subject to bright sunlight which could otherwise make wood take on a silver or grey appearance. Each element of this shed, the cladding, styrene glazing, roofing felt, and single sheet flooring and roofing, are made to the highest standards. 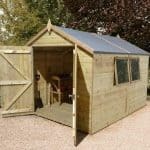 By dipping the timbers of the walls, and pressure treating the floor joists, Shed-Plus have ensured that this shed gets off to a great start in the battle against weathering. Annual treatment will be needed however to prevent rot occurring in future years. A pent design can sometimes eat into storage space, but on this occasion there is still adequate storage space for most gardening needs. It is recommended that two people work together when constructing this shed. We found the instructions easy to follow, all the fixtures were included, and it took around two hours to install. For this price, the owner gets a large storage space that also looks highly attractive. Extra costs will be incurred, however, through the purchase of paint, wood preserver, and a padlock. Final Thoughts: The pent shed is a modern design classic, and this is a great example from Shed-Plus. Its wide front makes it suitable for gardens where space is a primary consideration, and yet it offers a surprisingly large storage capacity. We really like the position and design of the dual windows, as they allow a good amount of light in without being too obtrusive or reducing your privacy. With styrene glazing included as standard, they also offer protection against vandalism or attempted break ins. The level of weatherproofing is also to be praised, aided by the dipping treatment and the rain repelling overlap cladding.